How do you find investors? It’s probably the question that founders ask me the most and with a good reason too – investors can be really hard to find. The question that quickly follows is naturally how to successfully contact them once they have been pointed out. I usually say that dealing with investors is a lot like dating – you have to build a relationship over several months before there is enough trust for the magic to happen. It is like looking for a potential girl or boyfriend – you can find them in many different places, but the likelihood of closing a deal greatly enhances when it’s somehow through your network. Step 1 is making sure that you are actually ready to fundraise. More often than not I see founders eagerly starting to fundraise without even knowing how much they are looking to raise or have a decent investor deck. I won’t go into depths with fundraising requirements here, instead this will be fully covered in another post. Step 2 is realizing that quantity matters. The more investors you line up the better chances are that someone will like what you are doing and write you that check. You need to treat your fundraising like you treat your sales and create an effective sales funnel. Since nothing beats excel when it comes to creating a simple funnel, that’s exactly what the AngelList Hack will do for you – create a spreadsheet with investors from any given location. You might ask yourself: “Why don’t I just use AngelList for that?” Because AngelList is a great directory for looking up investors, but doesn’t really do well as a hit list. On AngelList many investors have tagged themselves under more than one location, which makes it difficult to figure out where they are actually located. At this point I need to emphasize on the importance of being able to have a face-to-face meeting with investors, and thus the need to know their whereabouts. Investors in given “City” – means that the investor has the City as his location on Linkedin (hottest lead since you can take real face to face meetings). Investors not in given “City”– means that they have tagged themselves in that city on AngelList, but it is not their location on LinkedIn (may not live in your City, but is most likely active in it). Investors with unknown location – means that they have tagged themselves in that city on AngelList, but that they haven’t stated their LinkedIn details ao their location can’t be confirmed (They might still be living in that City, so try and find out). Website – An easy way to see what company they are working for – if it is a link to LinkedIn then they are likely an angel and aren’t part of a firm. Note (blank) – Use this to make your own notes or what type of companies they invest in / what the next action is eg. “sent deck 12/05”. Step 4 is organizing your spreadsheet. First of all the column width needs to be adjusted so you can get a better view of the information. If you need to share it then go ahead and upload it to Google Spreadsheet and start collaborating. If you need a great sales funnel tool then try Streak that works inside gmail. The stage of investments is the most important factor when sorting investors. A late stage VC will very rarely invest in you “powerpoint” startup. Conversely, a small angel (like myself) will rarely invest when your startup is at a valuation of more than $5M. Since this information is already provided in the spreadsheet you should quickly be able to narrow down the investors that are eligible to invest at the stage where your startup is at. Sometimes its not completely clear or they have stated both VC and Angel, so then you will have to jump to their AngelList profile or LinkedIn to double check. Your connection to the investor is important, because that will help you get in contact with him or her. Is it a first hand, second hand or even more distant connection? A bit of research into their LinkedIn connections and portfolio companies is whats’s needed here. Check if you have any common connections on LinkedIn or if the investor has invested in other startups you know of – you might be able to find this information by checking their AngelList portfolio. Find the best connection to the investor and ask that person for an introduction. When you have found a relevant investor then a good tip is to check the “People Also Viewed” section on his or her LinkedIn profile. You will likely find similar investors that could also qualify for investing in you startup. Area of investments is important, especially because some investors have areas they simply don’t invest in and others could have an investment “thesis” that they stick to (1). If it is an angel, then you can check his area of investment by doing a bit of research on his portfolio or check his blog to see if he states any areas of interest there. If it is a VC, then they typically state what startups they target on their website. Especially if this is your first funding round you want to make sure that they are into whatever it is you are doing. Even details like what type of business model might make a difference to them, eg. if you are doing b2b or b2c. Amount of recent investments is also important, because it gives you a good indication of how active they are as an investor. If their last investment was more than a year ago chances are that they are not investing in any new startups at the moment. If it is a VC then you can check when they raised their last fund. If they just raised, chances are they are hungry for new investments and want to get their portfolio started. Type of investor means who they are as a person. Like with any other relationship you want to have a connection and the stronger that connections is, the better. We tend to like people we see ourselves in or as the saying goes “one should stick to one’s own class”. If the person likes you then chances are bigger that they will think you are cooler, smarter or more consistent than people they don’t get along with as well. To give you a personal example: I’m an out of the box type of person who doesn’t ask for permission first. I like to focus on the big picture and I have a degree in economics. If I pitch a VC that was a super nerdy hardware guy back in the 90’s and who likes people that pays attention to details and who tend to micromanage everything, then chances are he will think I’m a crazy guy that will spend his investment recklessly. On the other hand, if he is a guy who made it big because he didn’t take no for an answer and believes that making deals and partnerships is more important than yet another product feature, then he might think I am one of the few that has what it takes. 1) Look him up on LinkedIn -> check if you have any connection in common that would be able to do an intro -> shoot them an inmail or email and ask politely if they could introduce you and your startup. Draft what you would like them to write to the investor -> people are lazy, so that greatly increases the chances of them actually doing it. 2) Find a company that the investor has invested in through his portfolio on AngelList -> look the company up on linkedIn -> see if you are directly or indirectly connected to any of the people working there -> if yes, then ask the most senior for an introduction. This works even if you don’t know them that well, cause more often than not founders like to help other founders. 3) If you don’t have any shared connections on LinkedIn then you can try to get hold of a “super connector” and ask if they can help with an intro or know someone who can. A super connector could be another investor that you are in contact with, a founder that have raised several rounds of funding, a person that is running an incubator etc. This person might not be directly connected to the investor, but most likely know someone who is. 4) If you don’t know anyone who can get you through to the investor, then try and research the person a little further (check his blog, tweets etc.) and see if he is attending a conference, is going to give a speech somewhere or if there is some other event where you could run into him or her and have a chat. 5) When you run out of ideas on how to get through to an investor then the last resort is to send them a direct message on LinkedIn and explain why this makes so much sense for them to have a look at. It always helps to give them some sugar by saying you really want to utilize their huge knowledge in this space etc. Step 7 is creating the biggest possible sales funnel of investors. The AngelList Hack is a good starting point, but you can do a lot more yourself. Ask other founders if they know someone. Go to all kinds of startup events and try to meet as many people as possible. Go to coworking spaces and try to socialize with people and get their contacts. Always remember to ask an investor for additional investors contacts that could be interested once you have a dialog going. Consider doing further research on LinkedIn, AngelList and on the web in general. For comments, ideas or input to the AngelList Hack please leave a comment. The course is held in beautiful Bali and you can read everything about it on GetawayIgnites newly launched site. Really valuable post. Two thumbs up for it. And thank you for the angel list hack! 2.) The search looks for substrings in a bigger string, so if you put in a city name that’s a substring of another city, you’ll get investors from both cities. For example – if you put in York, you’ll get New York as well. (not sure if anyone will find this an issue, but it’s something to consider. Hey Luca! Its up again tomorrow! Absolutely awesome tool which literally saved me days of work. Thanks! 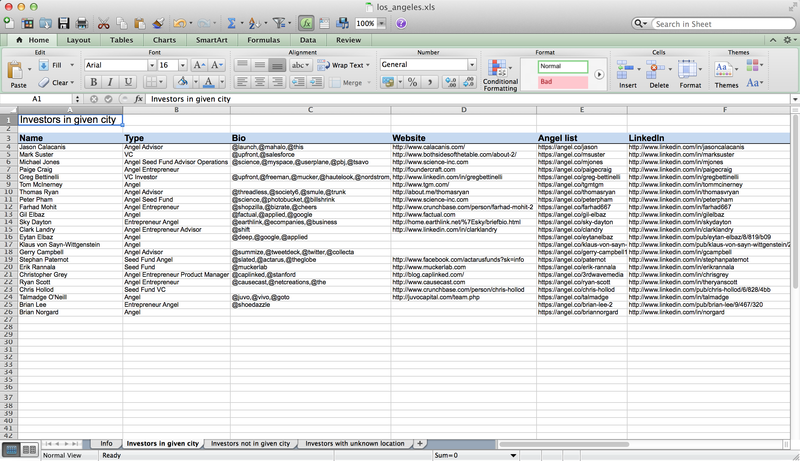 1. remove the http(s):// prefix if you want the cells to be automatically converted to linked in google spreadsheets. 3. add a column for “avg check size” which along with the “type” column really gives a good indication on whether they are a good fit for your stage.